It’s been a while since we last attend an affiliate conference, so we’re really looking forward to the iGaming Super Show in Dublin later in May. The conference has a great schedule of sessions and I’m Particularly hoping the talk on wordpress SEO optimisation will yield some useful information. The conference is a four day event and every day has a session I want to attend, whether that’s the talk on emerging markets or the discussion on in-play betting. One of the best reasons to attend any iGaming event is the people you meet, we’ve always had a great time socially at these events and they’re a brilliant way to put faces to email addresses. The parties thrown by casinos & bookmakers at iGaming events are normally awesome, but I’d definitely warn affiliates about getting involved in the poker games, especially in Barcelona – as a night in a Spanish police cell is not for everyone! If you’re heading to Dublin on the 22th of May and want to talk to us then just drop me a quick email. One of the great things about being an Affiliate is you sometimes get some amazing free Christmas gifts from the networks and merchants you work with, last year Market Ace filled my stocking with amazing gadgets, gizmos and even a relaxing weekend break. Unfortunately not all Affiliate networks are as generous as Market Ace, so this year I’m going to keep a running list of the gifts we get as Christmas presents. Last year was a real mix of the good, bad and ugly and then there are the Networks that just don’t bother sending anything. I’m not going to mention names but… it starts with Trade and ends in Doubler. As a rough estimate I think our sites have generated over half a million in sales at TradeDoubler over the last four years, god knows how much you need to generate to get a Christmas present outta them, and they wonder why I’d rather promote Jackpot Joy with Market Ace! I know that it’s not good form to moan about Christmas presents you receive, but if some networks insist on playing Scrooge, then I’m playing the spoilt brat! Top marks for St Minver being the first present down the chimney! 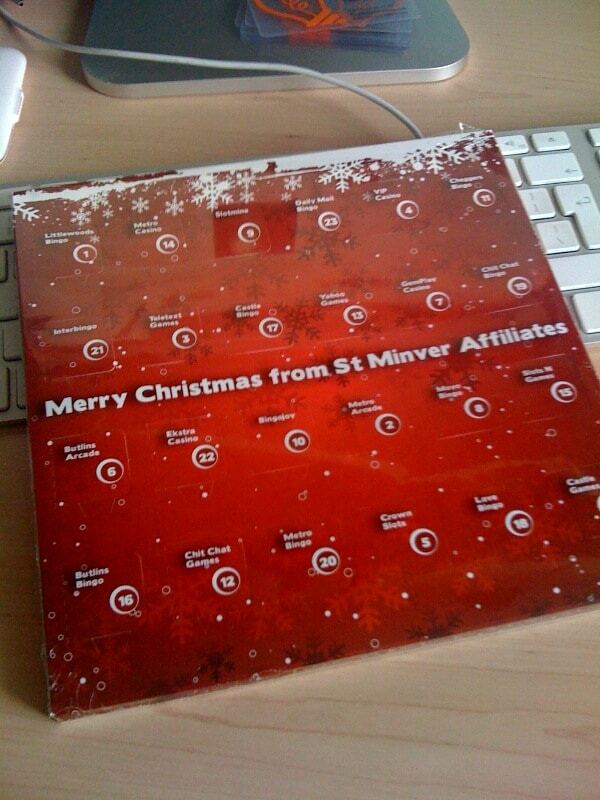 To be honest we don’t send St Minver lots of players so I wouldn’t really expect anything from them anyway! There more like a distant cousin you’ve only ever met once and then bump into on Christmas day. To be fair to St Minver the box of chocolates look good and it’s presented like a traditional advent calendar, chocolates are always a winner in my book! The box also has a promo code on for Affiliates which is actually good marketing. St Minver are a network that promote mainly bingo sites like Butlins Bingo and Littlewoods Bingo, you can check them out here. So this year is already off to a pretty good start, lets see what tomorrow brings! So Christmas is well and truly over and the new year is here, so what did Santa bring? 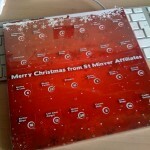 Not a lot actually, apart from Paddy Power and Market Ace who sent us some lovely gifts (Thanks Guys). It seems the credit crunch is hitting the gambling sector after all, I didn’t even get a card from most of our partners! Football clothing merchant Kitbag informed us today that our site www.retrofootieshirts.co.uk had won their latest affiliate competition and landed a £500 cash prize! We promote Kitbags excellent range of Retro Football Shirts through our site www.retrofootieshirts.co.uk. We’d like to thank John from Kitbag for the generous prize, Burnley fan John was dismayed to find out the money will be ‘wasted’ on tickets to watch Manchester United at Old Trafford!